There are numerous places with WiFi, free or with password, literally everywhere, where there is a cafe or a resort. But for really doing some work here, I’d like to have a laptop. But as it is, I’m just fine with typping everything into my phone and uploading it from there. It’s just so handy (the Germans will get that pun…). We’ve been hanging around Koh Tao for some more time now and decided it’s time to leave for the next island. 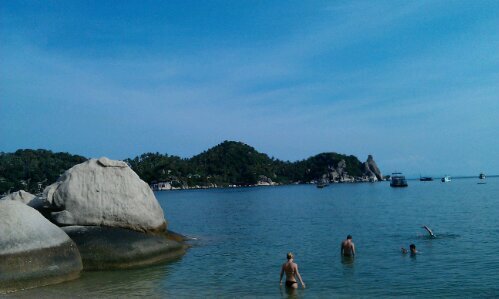 If you don’t dive Koh Tao is nice but a bit boring after some time. We are going to Koh Phangan tomorrow, having booked the tickets just now here at the cafe. And no, not for a full moon party. I’m far to relaxed for some crazy trance party. Honestly, I don’t care much for party at the moment, getting up quite early every morning, around 8-9am, having breakfast and then just enjoying the place here. Later I’m having a little nap after lunch (yesterday we slept from 12.30-3.00pm just like this) and in the evening a beer after dinner, maybe watching a movie on an outdoor screen In a nearby resort and then back to bed again around 10pm. Just such a relaxing lifestyle. 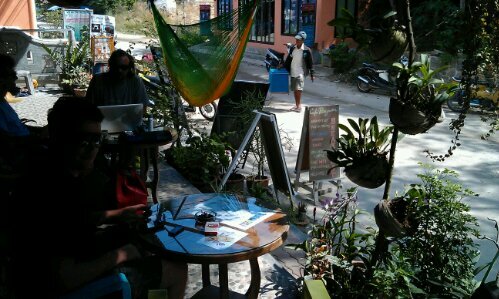 This entry was posted in Thailand and tagged Beach, Cafe, Koh Tao, Summer by kathatravelling. Bookmark the permalink.